BUFFALO, N.Y. -- Three Western New York women participated in a nationwide movement last year to protest the newly installed presidential administration and advocate legislation regarding human rights. The trio was so compelled by their experience that they decided to capture the movement’s significance more permanently. 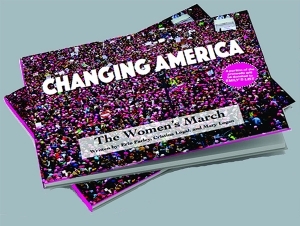 The authors of Changing America: The Women’s March, Cristina Logal, ’07; Erin Farley, ’08; and Mary Logan, will host a book launch and open conversation on Friday, November 16, at 6:00 p.m. in the Jacqueline Vito LoRusso Alumni and Visitor Center on the Buffalo State College campus. The event is free and open to the public; free parking will be available in Lots G-20 and G-22. “We were energized by the events surrounding the 2016 presidential election, and we felt we had to be a part of the Women’s March in Washington, D.C.,” said Logal, an adjunct instructor in Buffalo State’s Modern and Classical Languages Department. The march was the largest one-day demonstration in United States history, with more than 4 million people protesting in cities across America on January 21, 2017, the day after the Presidential Inauguration. “It was beyond electric to see all those people, their signs, and their passion. We felt like we had to preserve that moment in time,” Logal said. On their drive back from D.C. to Buffalo, Logal and her co-authors decided to write a book. Their book does feature photos from demonstrations across the country, but it also offers guidance for readers on addressing women’s parity in politics—especially in today’s sociopolitical climate, Logan said. Post-election activism and civic engagement go hand in hand, according to Logal. She hopes the book will inspire readers to run for office, participate in political campaigns, or become advocates on specific issues.